Hello. Hope you are having a good week. My little one has started walking - she's managed 15 solo steps so far - it's so fun to watch, especially seeing how pleased she is with herself. I used patterned paper from MME's Follow Your Heart Be Happy pad, and a journaling card by Lily Bee (love using the reverse of these). 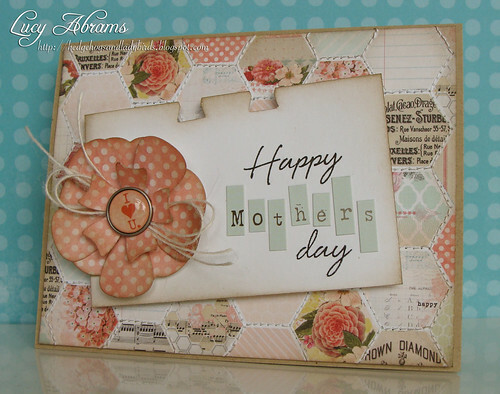 The sentiment stamp is from THIS set (I masked off the 'Birth' on 'Birthday', and the flower was made using THIS die. Oh and I used a brad from THIS set. Have a great day, back soon. Fabulous card, Lucy. Love the design and soft colours and that flower is just gorgeous. I can definitely see why they picked this card--it is amazing! Love how you stitched around the hexagons--looks like a quilt. You are right that mothers totally deserve that, but girl what an amazing stitching you did!! Wonderful detail and I also love that flower! Look at all those stitching! Very lovely card Lucy! It is a beautiful card. I hope the magazine lets people know it was yours! I can't believe that your little one is walking... where has the time flown by. So cute seeing little's walk and be happy..do remember that time well...mothers look happy too then ...so proud of their kiddo's! My first reaction when I looked at this beautiful card, Lucy was "Eeeek, look at al the sewing"! INvesting time in a project like this is so very worth it for someone so special!